This building was originally a spa hotel. It was a military hospital in the First World War, and later a convent and boys’ sanatorium. Thomas Heighway built the Highland Moors Hydro Spa after six springs were discovered in this area. His family had moved to Llandrindod from Ruabon (famous for its bricks and terracotta tiles) and founded a local brickworks as Llandrindod Wells expanded rapidly. Thomas leased the Rock Park and planted many species of trees there. His new spa hotel opened in 1911 and offered many treatments. In 1915 the Red Cross established a hospital here to treat wounded soldiers. Rheumatic soldiers also came here, for spa treatments. The Red Cross previously had a hospital in the town-centre County Club until the building was commandeered by the Royal Army Medical Corps, which had thousands of men billeted in the town. Musical patients formed the Highland Moors Glee Party and sang at local concerts, some of which were in the hospital. During a concert in 1916 soldiers presented a silver jewel case to Miss Gertrude Chune to thank her for her work as hospital quartermaster. The commandant, Miss Cara Venables of Llysdinam Hall, received a silver rose bowl from the patients in 1917. 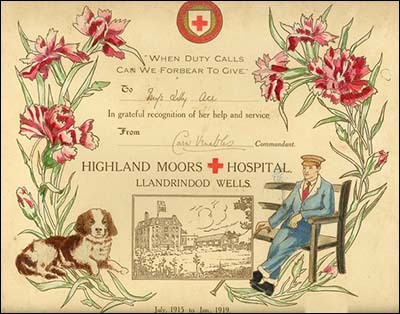 The certificate shown here, courtesy and copyright of the Radnorshire Museum, was given to Miss Lilly Ace in recognition of her wartime service at the hospital. One of the hospital’s patients, Private J Shortman of the Royal Welsh Fusiliers, died in March 1916 and received a full military funeral in the town. Children in Llanelwedd (near Builth Wells) took eggs and other foods to Sunday school each week for the hospital’s patients. Parishioners there and in other communities donated food, socks, bedding and bed jackets. The Highland Moors Hospital continued into the 1920s, after which the building became an hotel. In 1932 it became a sanatorium for boys with TB and asthma. The Missionary Sisters of Verona Convent occupied the building from 1958 to 1994. The original layout and fittings, designed for health tourists, proved to be ideal for many of these later uses, and few alterations were made. Since 2003 the building has been the Highland Moors Guest House. A memorial in Llandrindod Wells commemorates fundraising for the Red Cross in the Second World War.